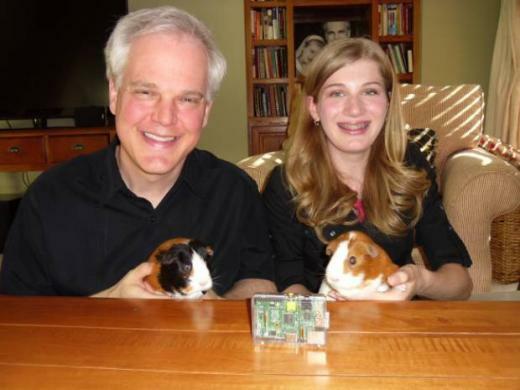 Last year, Lauren Egts designed and programmed a game (The Great Guinea Pig Escape) using a youth-focused programming language called Scratch. She presented it at the 2013 Cleveland Mini Maker Faire where it caught the eye of Element14's David Hamblin. He was impressed, and in June, Opensource.com shared Lauren's interview with David about how she got started programming and what her dad, Dave Egts, thinks of her hobby. In this interview with Lauren on The Dave and Gunnar Show, it comes as no suprise that Dave is thrilled that his daughter is interested in computer science and open hardware. You'll hear how proud Gunnar is too as he leads the interview, asking them both what kinds of things she's working on now (like her school's all-girl robotics team, The Fighting Unicorns!) and about her presentations on Gluster and on Scratch for Raspberry Pi at the Akron Linux Users Group (LUG). Lauren also recently won the the National Center for Women & Information Technology Aspirations in Computing 2014 Ohio Affiliate Award. Kids have a willingness to jump in. To break things. To just try it. What's impressive is that Lauren Egts is doing this with code and hardware. Don't miss her take being a girl programmer in this episode of The Dave and Gunnar Show! The Dave and Gunnar Show - Dave Egts and Gunnar Hellekson talk about government, open source, and Red Hat. Subscribe to the podcast via RSS!